Confession: Take a good look at this picture. 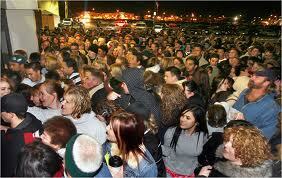 This is one of the reason I do not leave the house on Black Friday. The other reason is, I want to stay home is to eat leftover Turkey. For those of you who do head out to the stores on Black Friday, check out the 2010 Black Friday ads, at Black Friday info.